IL-33 is a member of the IL-1 cytokine family that is expressed constitutively in the nucleus of epithelial and endothelial cells as well as in CNS oligodendrocyte and astrocyte cells (1-2). Its release in response to cell damage and/or death has earned it the classification of “alarmin” – an immunological alarm signal that is released in times of cellular distress (3-4). Upon release, IL-33 binds to the T1/ST2 and IL-1R accessory protein (IL-1RAP) heterodimer complex to activate the MYD88-dependant signaling pathway (1). Studies targeting the function of IL-33 and/or signaling through its T1/ST2 receptor have highlighted the dual role this versatile cytokine pathway plays in the induction inflammatory immune reactions. More interestingly, these reactions can be either beneficial or pathological in nature. Here we will discuss the pathological role of IL-33 in disease. 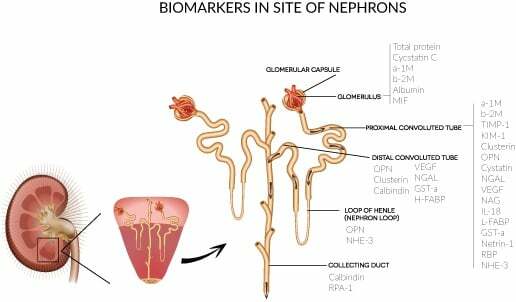 Acute kidney injury is a disease that is characterized by a rapid loss of kidney function, including the rapid fall in glomerular filtration rate (GFR) and the retention of nitrogenous waste over the course of hours and days. AKI is a complex, multifactorial disease with inflammatory, ischemic, necrotic and apoptotic events that occur simultaneously, leading to damage and functional kidney failure. The process of kidney injury occurs in stages starting with increased risk, followed by damage as a result of ischemic injury or toxicity, followed by a decrease in glomerular filtration rate (GFR), which further progresses to kidney failure.